Several monuments on and near Westport’s Compo Beach mark the starting and ending point of the invasion of Danbury by British forces who landed there on April 25, 1777. The British brought about 2,000 troops to Westport, who planned to destroy war supplies being stored about 20 miles north in Danbury. The British spent the night in Weston before reaching Danbury on April 26, where they destroyed food, medicine and ammunition (but didn’t do a great job of destroying a cache of rum, which they drank instead). Warned of the pending arrival of local militia, the British evacuated Danbury and retreated south, engaging in battles in Ridgefield and Westport before sailing away on April 28. 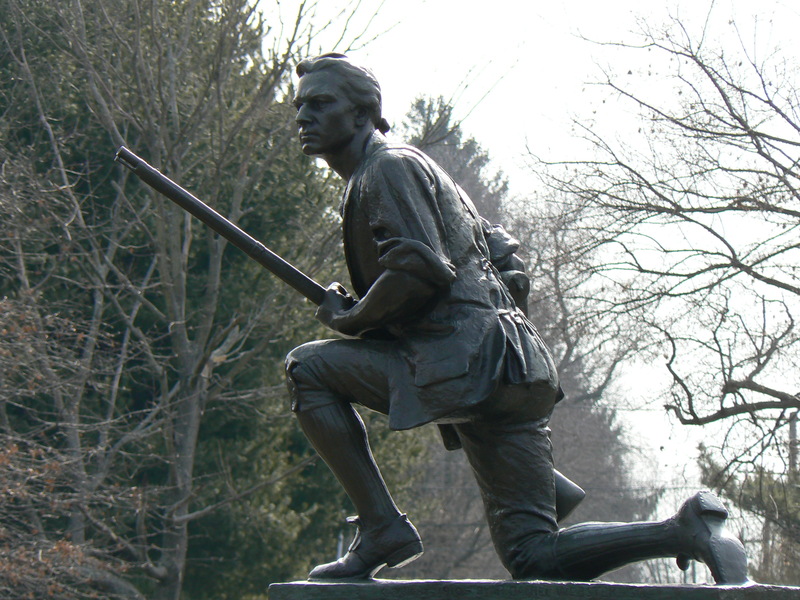 The British suffered more than 200 casualties in the fighting, and the Americans had 20 men killed and 40 wounded. 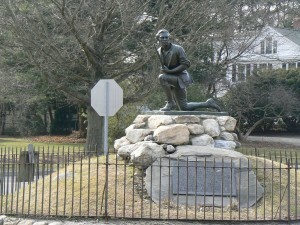 Westport marks the battles with three monuments. 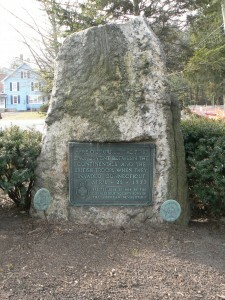 At the intersection of Compo Road South and Post Road East, a boulder bears a plaque reading “Here occured the first engagement between the Continentals and the British Troops when they invaded Connecticut April-25-1777.” The plaque was dedicated in 1914 by the Connecticut Society Sons of the American Revolution. 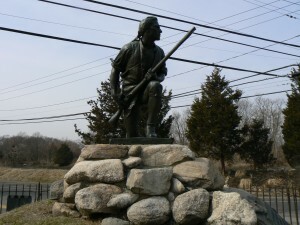 A bit further down Compo Road, Westport’s Minuteman monument kneels atop a traffic circle at the intersection of Compo Road South and Compo Beach Road. The monument depicts a musket-wielding Continental soldier waiting with his sleeves rolled up for the returning Redcoats. 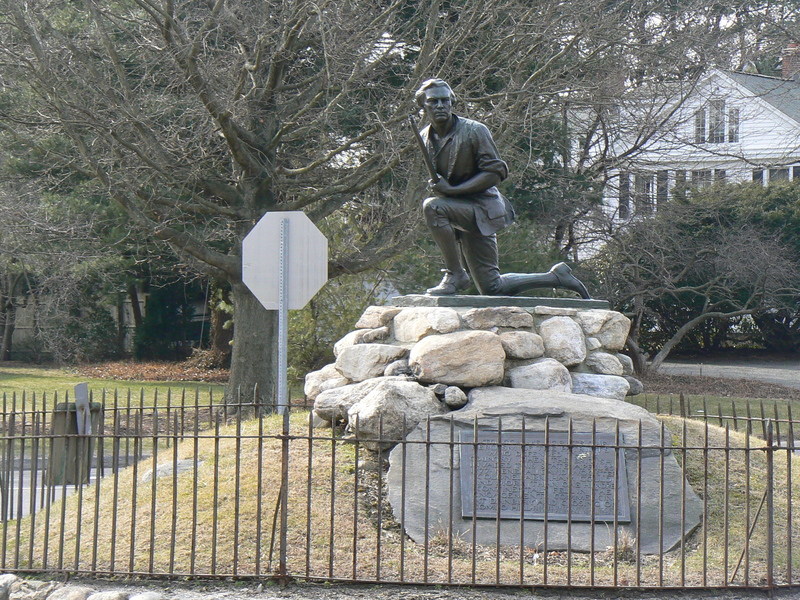 The monument, created by sculptor Harry Daniel Webster, was cast by Tiffany Studios in 1910. Continuing south to Compo Beach, a pair of large cannons have been mounted on a granite base to commemorate the fighting on and near the beach as the British returned to their ships. 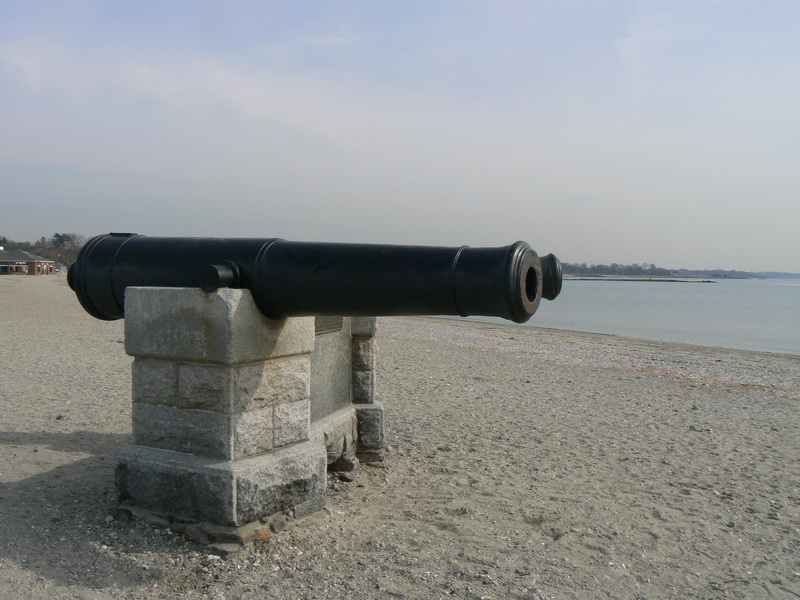 The cannons, whose markings can’t be distinguished, were donated by the U.S. government. The monument, dedicated in 1901, was restored in 1999. 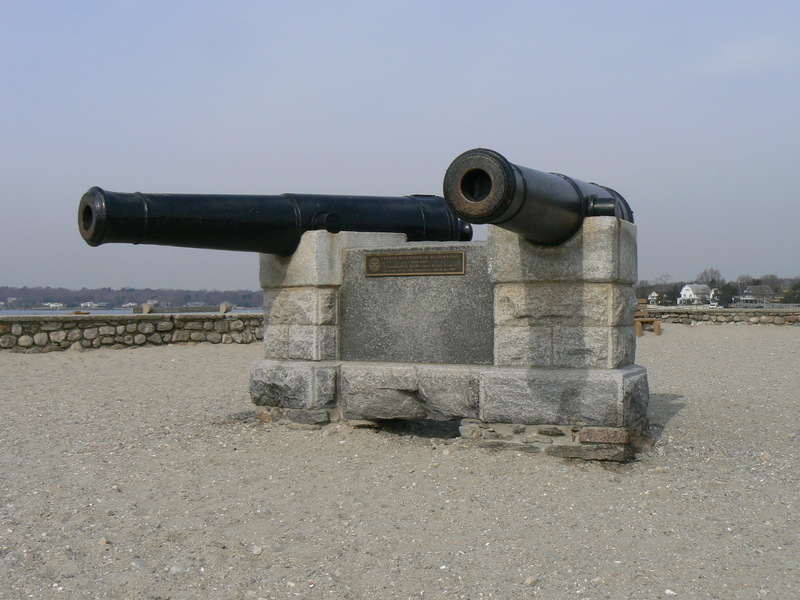 Let’s not forget that when the British arrived at Danbury the gunpowder and cannon they were after had been removed and hidden in the caves at what’s now Putnam Park. The reason they burned down so much of Danbury was anger and frustration at getting there and not being able to achieve their goal. Their entire expedition they were coming under ever increasing sniper fire and two really pitched battles. When they were coming back to their ships along Rt 33 into Westport their cavalry scouts discovered a cannon and large number of armed local waiting in ambush on Old Hill overlooking the only bridge across the Saugatuck. Their cavalry doubled back along what’s now cavalry road to discover a ford across the river (at Ford Road as it now is called and their troops marched along the path that became ARedcoat Rd to get there. Realizing the Brits had zinged toward their eastern left flank the Yankees, now numbering some 4,000 chased them over Minutman and Yankee hill roads after passing Tar Rock Road where the original tar-smoke signal had gone up to start the invasion response. The Redcoats had to run for their lives that last mile or so coming under very intense fire. They never again entered the area. The troops from New York marching to reinforce them at Ridgefield were stopped and turned back at Yorktown Heights by another large contingent of Colonials who resented their incursion. Though early in the war this campaign was important. The cannon and powder were hauled by oxen from General Putnams hiding place in the caves to the Boston area just in time as the Americans at Bunker hill ran out of ammo they retired to Breeds Hill where the supplies caught up with them to support restored action against the redcoats invader there in Massachussetts.